Al Read amazed at European LP Releases! Al Read was singer and guitarist with East of Eden on their first single “King of Siam” Atlantic Records 1968 which is included on two current LPs. In Germany on “Le Beat Bespoke 4″ Circle Records, CPWL 111 and in Poland on “Owski Urities Psych Beat” Private Press, 666-1. 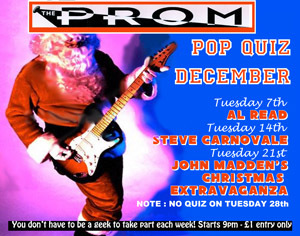 Al Read makes his regular appearance at the Prom Music Bar as presenter of the Pop Quiz on Tuesday 7th December. Al would love you to come along and join in. The majority of Al’s quiz is made up of music clips for you to identify - easy - well perhaps. Give it a try.